An inductor is an electrical device used in electrical circuits because of magnetic charge. 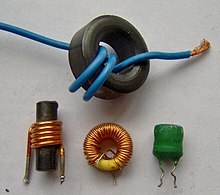 An inductor is usually made from a coil of conducting material, like copper wire, that is then wrapped around a core made from either air or a magnetic metal. If you use a more magnetic material as the core, you can get the magnetic field around the inductor to be pushed in towards the inductor, giving it better inductance. Small inductors can also be put onto integrated circuits using the same ways that are used to make transistors. Aluminum is usually used as the conducting material in this case. For how inductors work in series and parallel circuits, see Series and parallel circuits. While a capacitor does not like changes in voltage, an inductor does not like changes in current. Inductors are used often in analog circuits. Two or more inductors that have coupled magnetic flux make a transformer. Transformers are used in every power grid around the world. Inductors are also used in electrical transmission systems, where they are used to lower the amount of voltage an electrical device gives off or lower the fault current. Because inductors are heavier than other electrical components, people have been using them in electrical equipment less often. Inductors with an iron core are used for audio equipment, power conditioning, inverter systems, rapid transit and industrial power supplies. Electrical engineers like to reduce diagrams of electrical circuits, no matter how complicated, to an equivalent circuit consisting of a network of just four different types of component. These four basic components are emfs, resistors, capacitors, and inductors. An inductor is usually represented a little solenoid in circuit diagrams. In practice, inductors generally consist of short air-cored solenoids wound from enameled copper wire. ↑ "Inductors 101" (PDF). Vishay Intertechnology, Inc. 2008-08-12. Retrieved 2010-10-02. Wikimedia Commons has media related to Inductors. How stuff works How inductors work, made very simple. This page was last changed on 28 July 2018, at 09:19.